“The House with a Clock in Its Walls,” which opens on Sept. 21, 2018 and is rated “PG,” also stars Owen Vaccaro, Lorenza Izzo, Kyle MacLachlan, Colleen Camp and Sunny Suljic from writer Eric Kripke and director Eli Roth based on the novel by John Bellairs. To win your free passes to “The House with a Clock in Its Walls” courtesy of HollywoodChicago.com, just get interactive with our social media widget below. That’s it! This screening is on Tuesday, Sept. 18, 2018 at 7 p.m. in downtown Chicago. The more social actions you complete, the more points you score and the higher yours odds of winning! Completing these social actions only increases your odds of winning; this doesn’t intensify your competition! Deadline: Entries can continue being submitted through Tuesday, Sept. 18, 2018 at 9 a.m. CST. These Hookup winners will be awarded via e-mail on that date. If necessary: To see your entry count on a repeat visit, submit your name and e-mail again. If you have trouble submitting your entry below, please e-mail Adam Fendelman. In the tradition of Amblin classics where fantastical events occur in the most unexpected places, Jack Black and two-time Academy Award winner Cate Blanchett star in “The House with a Clock in Its Walls” from Amblin Entertainment. The magical adventure tells the spine-tingling tale of 10-year-old Lewis (Owen Vaccaro) who goes to live with his uncle in a creaky old house with a mysterious tick-tocking heart. But his new town’s sleepy façade jolts to life with a secret world of warlocks and witches when Lewis accidentally awakens the dead. Based on the beloved children’s classic written by John Bellairs and illustrated by Edward Gorey, “The House with a Clock in Its Walls” is directed by master frightener Eli Roth and written by Eric Kripke (creator of TV’s “Supernatural”). Co-starring Kyle MacLachlan, Colleen Camp, Renée Elise Goldsberry, Vanessa Anne Williams, Lorenza Izzo and Sunny Suljic, it is produced by Mythology Entertainment’s Brad Fischer (“Shutter Island”) and James Vanderbilt (“Zodiac”) as well as Kripke. 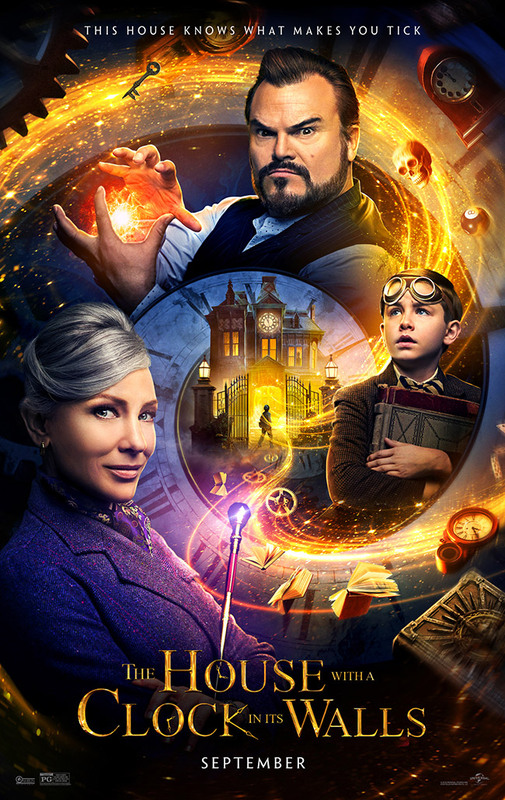 The movie poster for “The House with a Clock in Its Walls” starring Cate Blanchett and Jack Black. This HollywoodChicago.com Hookup is simple! Just get interactive in our social media widget above. We will award 40 admit-two movie tickets based on social entry numbers and/or randomly via e-mail for our “The House with a Clock in Its Walls” Hookup. Good luck! Your entry in this Hookup warrants your understanding of and agreement with these terms. HollywoodChicago.com winners must arrive early as seats are consumed on a first-come, first-served basis. Showings may be overbooked to ensure a full house, so winners are not guaranteed entry and must arrive early. We recommend arriving at least 60 minutes before the showing’s scheduled start time. Make-goods issued by the studio or its publicists are not guaranteed if you are declined entry for any reason. Per the studio’s discretion, phones and other recording devices may be required to be bagged and tagged for anti-piracy reasons during the screening. HollywoodChicago.com LLC is a promotional partner with the studio and its partners and does not assume any liability for this giveaway or the administration of screenings at movie theatres. HollywoodChicago.com is not responsible for errors or omissions entered in user submissions. Comments are closed in this Hookup.